She has a whole repository of Knock, Knock jokes. She makes them up. None of them make sense. They are not even funny. But we laugh. It really doesn't matter. Laughing does though. "If you were a director of a very important movie and one day something very important had to be done for the movie and also the same day something very important needs to be done for the family, what would you choose ?" I was stunned by the question. These are the kind of questions I would expect at the last page of Ladies Home Journal, not from a 7 year old. I am waiting to see if she spurs such stuff at Daddy too. I made Aloor/Alur Chop (Potato Fritters) after a long long time. I make these things so rare that sometimes I am not even sure the taste lingering in my memory is real or laced with imagination.Should it taste like this or should it taste like that ? The that is illusionary. This time I made it more spicy because I thought I prefer it that way. The husband's version is a tad less spicy. He says, mine are pretty good but not like Shoshthida's. Shosthida, the neighborhood telebhaja guy, spiced the potato less. Makes sense. Shosthida, with all my apologies and admiration, had his perspiration, diesel fumes and dirt under his nails to make up for less spices he used. I perspire too, but not when the temp is at 45F and central heating is just making us comfortable. Deep frying however makes up for anything I lack. With a bowl of muri on the side and a steaming cup of tea you won't ask for anything more. Ok, a "knock, knock" joke perhaps to complete the scene. Get this recipe in my Book coming out soon. Check this blog sidebar for further updates. Boil the potatoes, peel the skin and mash them. Use your fingers or a masher. Heat little Oil in a Kadhai/Frying Pan. About 1-2 tsp should be fine. Add the chopped garlic, minced Ginger, the green chillies and the onion.All of these should be chopped real fine so that you do not bite into anything but the potato when eating the chop. Sauté till the onion wilts and is pinkish brown. Add the Roasted Cumin powder and Red Chili Powder and saute for a minute. Add salt and mix the masala well with the potatoes. Do not fry or cook the potato any further.Add a few drops of Mustard Oil to the potatoes if you want. Flatten them between your palm and place them on a lightly greased surface. They should be really flat and NOT thick like alu tikki. Make a batter with the ingredients under Make Batter. Add the water gradually as you don’t want the batter to be runny. The batter should be tight as it has to form a coating on the potato patties. Heat Fresh Oil in Kadhai/Frying Pan. The patties would be deep fried so add enough oil. Gently release the dipped patties in the hot oil and hear the sizzle. Keep heat at medium. Fry till both sides are golden brown. Drain excess oil by placing the fried patties on a kitchen towel. @ Wow! Thanks for posting this... I will finally get to eat authentic 'alur chop' in Bengaluru. "I think anything fried is a guilty pleasure and each is good in its own way"
Those aloor chops looks sooo yummy,prefect evening snacks..
Silly one I know .... but I luv your version of Alu chop. And the marriage of alu chop with muri ... perfect !! My two year old says the same "Knock Knock" and i have to reply back "is it Pingu? "For him,pingu is the inspiration of crazy "knock knock". Thanks for the the alur chop recipe.,i will try to do this weekend(anyway weather says this weekend will be with snow shower..ideal for alur chop and muri. Loved the analysis behind Shoshtida's tasty chops. We can never recreate that ambience at home, lol. Loved the Benagali newspaper holding Muri and Alur Chop. After coming to Bangalore, never had Alur Chop and Muri in the evenings. Must try this over the weekend. But I prefer Beguni or Piyazi over Alur Chop. ekdom. maayer eggroll never tastes as good as Bapi's. maa says it's all because of the dirt and sweat and.....I never let her finish the list. khub sundor lekha, as always. Visiting your blog after many many months, good to see the aloo chop. my Mom's favourite aloo chop diye muri bhaja. 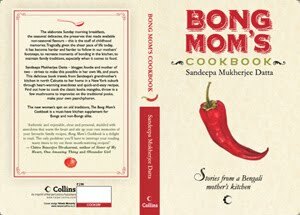 Bong Mom, how could you have suspected a girl who cracks such jokes may not be a foodie!! LS.. tussi chha gaye! I have neve rhad this but jus tlooking to the pic i am drroling. Sandeepa, what will we ever do without these little human beings? I have had enough knock knock jokes to last me a lifetime and more but the pleasure it gives these kids is immeasurable. Your alur choop is just delicious looking. aloor chop and then on Bengali news paper, I will never complain not getting "sashti da's" chop anymore!! and those knock knock jokes, glad that other mother out there laughs just like that too!! Btw, is your husband from Behala (Kolkata) by any chance as we have a famous Shosthida there as well ? its like "Ram milaye jodi"
LS already knows Knock Knock jokes? Wow! How do you get the potatoes to form into patties? Doesn't seem to work for me. Mashed potatoes --> make small ball -->pat between your palms --> voila, a patty. If you are unable to, maybe there is too much water content ? Dry it up the by sauteing in the pan with the onion etc. 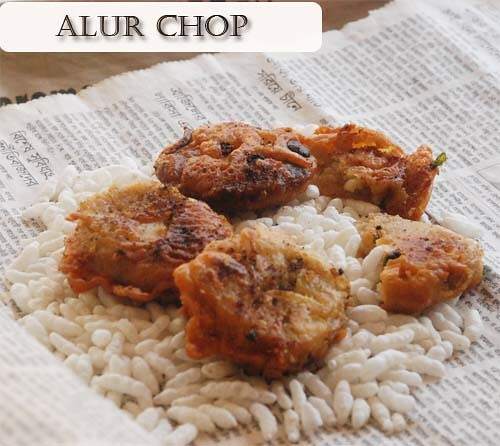 Alur chop is perfect for the cold weather, never made this way! I like the look of the aloor chop and will make it soon because I am mystified by the pairing with muri! Seems a perfect evening snack. wow, so nostalagic, I love alu chops from back home, you reminded me of that, just perfect. agree with roshmi here, the bajji is nowhere compared to aloo chop! love to read ur posts :) missed watching the oscars :( was busy with my 5 mo.. The chops look delicious in the picture...am drooling! Yeah Yeah - daughters, bring on the hypothetical guilt! Only they can think of such questions! Nice. I make alur chop all too often. 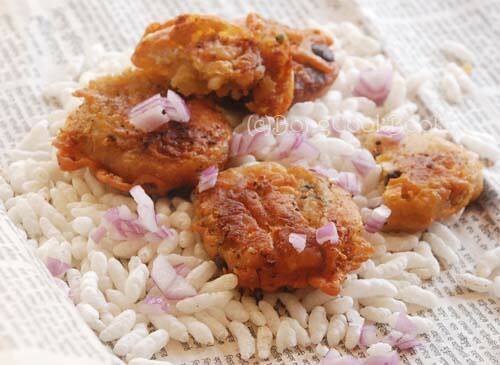 Here is a vegetarian version of alur chop. I don't use onions or galic in this recipe. Hope you and your readers like it.